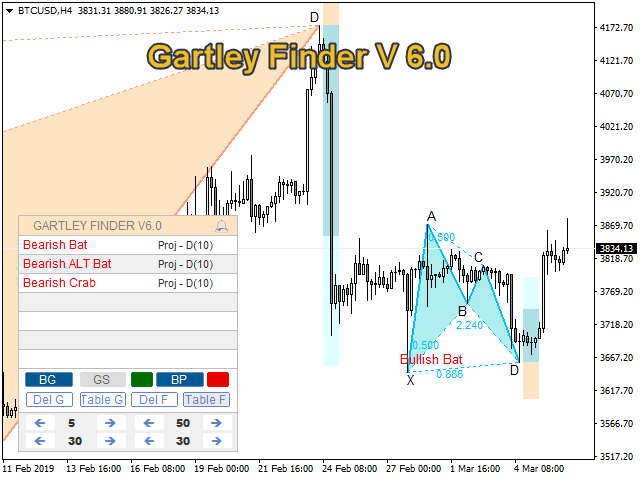 Gartley finder is an indicator for finding Gartley patterns. 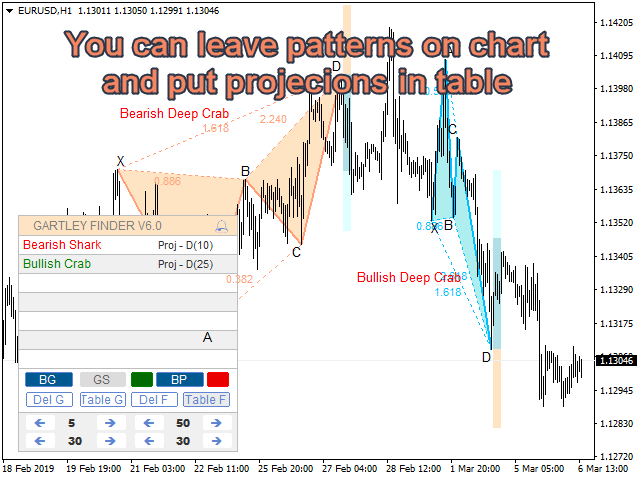 The indicator displays targets for entering and exiting the market, is able to build projections of patterns into the future, is equipped with alerts and notifications to a mobile phone, as well as the function of automatically searching for Gartley patterns of various sizes. The following points describe the main characteristics of the indicator. 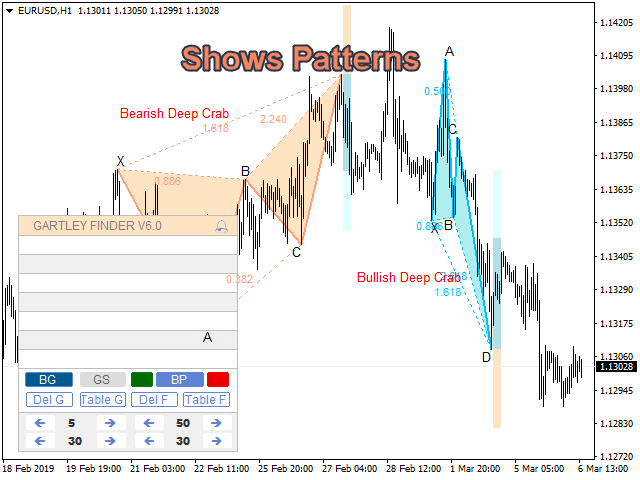 The indicator finds and displays patterns of various types and sizes on the chart. Everything happens in full automation mode. 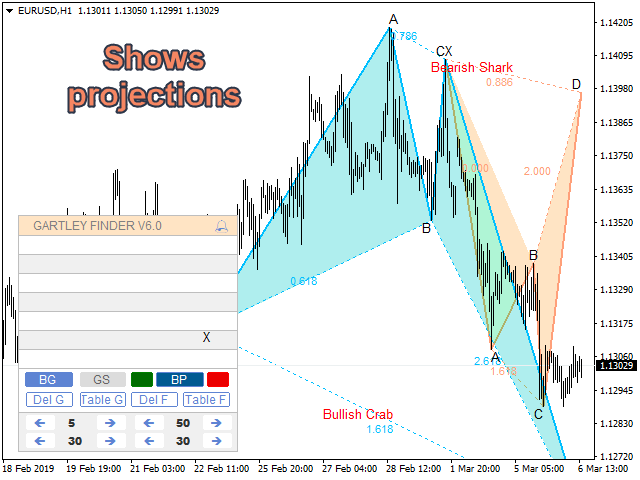 Classic: Bat, Alternative bat, Butterfly, Crab, Deep Crab, Gartley, Shark. Exotic: Monogram (Cypher), White Swan, Black Swan. You can search for patterns of lower and higher orders. The sizes of the patterns are adjustable from the panel at the bottom. The indicator draws targets for entering and exiting the market. Goals are displayed as bars to the right of each pattern found. Stop Loss: maximum or minimum of the orange bar. Take Profit 1: maximum or minimum of the blue bar. Take Profit 2: maximum or minimum of a light blue bar. The indicator builds projection patterns into the future. This parameter is controlled from the indicator panel. 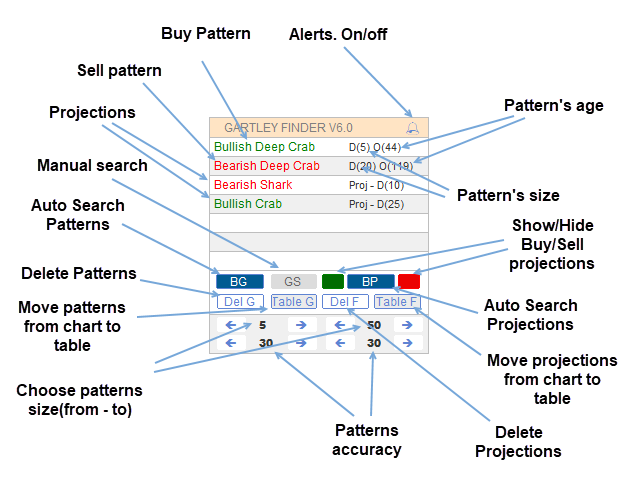 If you wish, you can display only buy or sell patterns, as well as place them in a table in the lower left corner of the screen. Alerts are realized using the “Bell” sign in the upper right corner of the panel. If the button is pressed, the indicator will alert you when patterns appear. In the lower left corner of the chart there is a signal panel to control the indicator. 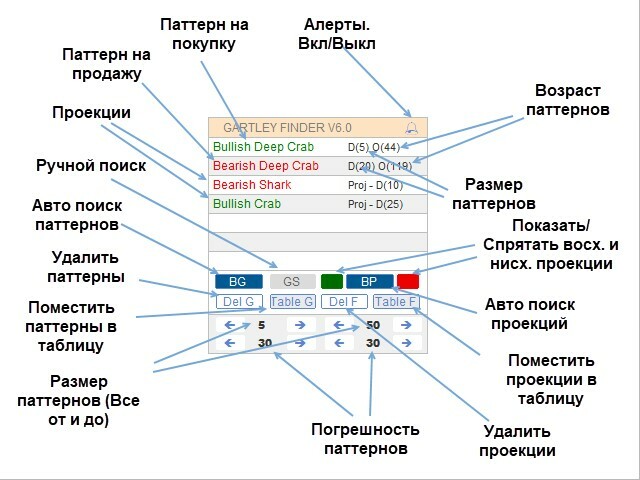 For a description of all the buttons, see slide number 6 for English-speaking users or slide number 7 for Russian speakers. StepDepth - the step size of the Zigzag indicator. It is controlled by arrows to the right - to the left. Deviation, Backstep - Zigzag parameters. Price_Bar - Drawing point D patterns at the current price (current) or the last close (close). infelicity_shadow -% of the possible failure to reach the shadow of the candle target level. Maximum 45%. infelicity_head -% of the possible body of the candle for the target level. Maximum 45%. StepInfelicity - step size to change the error. It is controlled by up-down arrows. clr_linethup is the color of the buy pattern lines. clr_trup - the color of the buy pattern triangles. clr_chup - the color of the displayed Fibonacci levels of buying patterns. clr_linethdown - the color of the pattern lines for sale. clr_trdown - color of triangles of patterns for sale. clr_chdown - color of the displayed Fibonacci levels of patterns for sale. colorclr_pt - the color of the letters X-A-B-C-D.
colorclr_ptname - the color of the pattern name. colorStopLoss - the color of the StopLoss level zone. colorTakeProfit_1 - color of the first target zone by pattern (Take Profit 1). colorTakeProfit_2 - the color of the second target zone by the pattern (Take Profit 2). Depthsscan - the step of resizing patterns. displayPatern - Display / not display patterns. MaxPatternAgeScan - Maximum age of patterns that the indicator can find during scanning. SendPushResult - Send or not a notification to a mobile phone. Доработан алгоритм отрисовки столбиков стопов и профитов. - We optimized pattern search algorithm. The number of patterns has increased significantly. - We Fixed the bug of disappearance of TP and SL at the beginning of the week when a pattern appears before the weekend. - The DG button now removes patterns only on the time frame on which it is pressed, and not on all, as it was before.